(Aster, White Wood (Aster divaricatus) - 01) The literature says that white wood aster can grow to heights of 2-1/2 feet, but most of the ones we have seen are less than 1 foot in height. 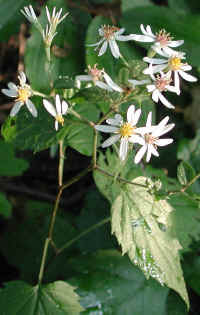 Two of the main characteristics of the white wood aster are that they have few ray flowers and somewhat heart-shaped, toothed leaves. (Aster, White Wood (Aster divaricatus) - 02) These white wood asters are just beginning to bloom. 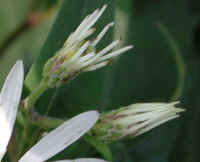 White wood asters bloom from July through October. 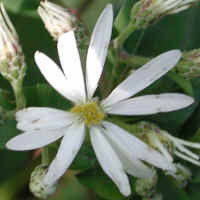 It is one of the earliest blooming asters. 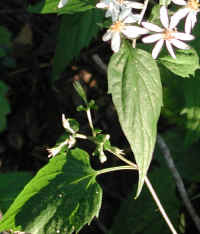 (Aster, White Wood (Aster divaricatus) - 02a) As the composite flowers of the white wood aster begin to open, the ray flowers extend forward into a point and then begin to expand. 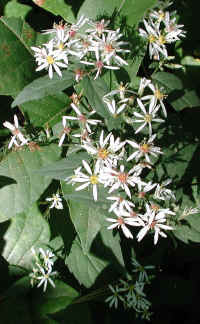 (Aster, White Wood (Aster divaricatus) - 02b) The number of ray flowers on a fully opened white wood aster may be as few as seven and as many as twelve, as on this one. The actual size of this fully opened flower is about one inch across. (Aster, White Wood (Aster divaricatus) - 03) These white wood asters each have between 7 and 9 ray flowers. This side view of the white wood aster allows us to see the characteristic zigzag-shaped stem and the somewhat heart-shaped toothed leaves. 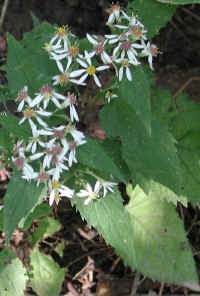 Also note that the disc flowers of the white wood aster begin as yellow and turn purple or brown as they mature. (Aster, White Wood (Aster divaricatus) - 04) The reason why we say that the white wood aster leaves are somewhat heart-shaped is because sometimes they look more like a broad lanceolate leaf, like the one in the center of the photo which is more typical of other aster leaves. But on another branched stem of the same plant, we can see the underside of a more heart-shaped toothed leaf (lower left of photo). (Aster, White Wood (Aster divaricatus) - 05) This is a mature white wood aster with almost all heart-shaped toothed leaves and with most of the disc flowers having turned purple.